Faux leather, as opposed to genuine leather, is an excellent choice in a lamp shade. Below are faux leather lamp shades for sale on Amazon and eBay. The selection is usually excellent with shades available in a wide variety of sizes and styles. Faux leather provides a realistic appearance while being durable, often withstanding scrapes, scuffs, etc. that would damage real leather. It is also low maintenance and provides the look and feel of real leather at a more affordable price. 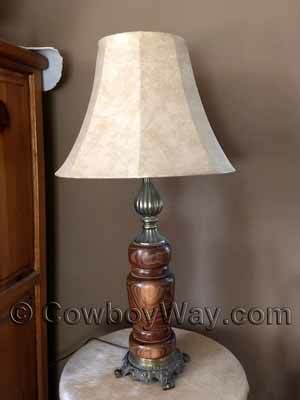 Below: A faux leather lamp shade on a wooden lamp. Since the word "faux" means false, artificial, and/or not genuine, faux leather is false, or imitation, leather. However, that's not not necessarily a bad thing and can often be a good thing. Price - Faux leather is typically more affordable in a lamp shade, often by a wide margin. Availability - Genuine leather lamp shades can be difficult to find, particularly when you narrow the choices down by size and style. Faux leather lamp shades, on the other hand, are comparatively easy to find and are available in a variety of sizes and styles. Durability - Faux leather shades are quite durable, and often withstand scratches, scuffs, and scrapes without noticeable damage that would mar the appearance of a real leather shade. Maintenance - Real leather lamp shades require periodic cleaning and conditioning to be maintained, otherwise they could crack, split, or dry out. Faux leather shades, on the other hand, require far less maintenance, with a quick wipe from a dry cloth often being all that is necessary to maintain their good looks. If you find a faux leather lamp shade on Amazon that you like but you're not ready to purchase it right away, you can always add it to your shopping cart so it will be easy to find later.